Posted on November 22, 2017 , in Hot Tubs. If you have made the decision to purchase a hot tub, now is the time to start planning what type of enclosure you would like for it. There are so many different options available from simple and economical to elaborate designs that seamlessly integrate into your landscaping. In the article below, we will look at some common enclosure choices to start giving you some ideas for your new hot tub. A similar look to old fashioned water wells, these enclosures have a roofed cover and open walls perched on a wishing well enclosure. This style gives a rustic look to a backyard and will protect bathers from sun and rain while still providing a view of the surrounding landscape. A simple wooden pergola design keeps some of the sun’s rays out while keeping an open exposure feel. Designs can range from simple to elegant and a sun shade enclosure will also help shield bathers from light precipitation. A summer solstice style enclosure surrounds your hot tub with 4 wooden posts that are covered with a canvass umbrella. This design is perfect for keeping leaves and debris out of your hot tub as well as protecting bathers from getting sunburned. One downside to this type of cover is that on very sunny days it can add heat which some bathers may find uncomfortable. For a modern meets rustic feel, surround the hot tub with stone walls and finish with 4 wooden posts with an attached metal roof. The texture and color combinations can be completely customized to give a natural or dramatic look. To accessorize, place potted plants around the stone walls and add a nearby fireplace. To make your hot tub the focal point of your backyard, consider building a gazebo deck. Designs can incorporate plenty of space for sun chairs, a BBQ corner or a bar area. Adding walk up structures to a gazebo deck give a refined look and the roof enclosure will protect bathers against the elements while still being able to enjoy an open-air feel. If you already have a large deck, adding an enclosure with walk up steps and a wooden cover looks fantastic and offers convenience. 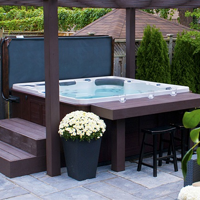 By placing the hot tub on your deck, you can extend your living space and enjoy relaxing in your hot tub which will just be steps away from your home. For a finishing touch, add a few hammocks or a patio furniture set with a nearby BBQ to make the perfect entertainment/living area. A simple but elegant hot tub enclosure is using 4 large posts with a pergola design and hanging long curtains from the top. When bathers want privacy they can hang the curtains or tie back for an open-air feel. An exciting part about buying a hot tub is thinking about the many enclosure options. In the end, the only limit to design and style options is your imagination, space, and budget. From wooden structures to sundecks to fiberglass arbors or even an elaborate garden style grotto, your hot tub will instantly become one of your favorite parts about your home. Remember that before you make a decision regarding an enclosure that you speak with your hot tub dealer. They may have some helpful recommendations or referrals and direct you to check with a plumber and electrician to approve the design. Hot tub enclosures are a perfect way to add some privacy to your bathing experience as well as upgrade your landscaping. Now that you know just a few of the different enclosure options available, download a hot tub buyer’s guide to find the perfect Hydropool hot tub model for your home.